Considered a vegetable by most, eggplant is botanically a fruit and a member of the nightshade family. 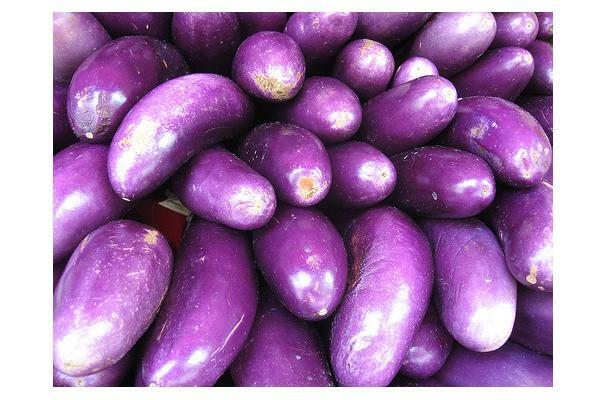 Eggplant comes in many sizes and colors, ranging from purple to green, white, lavander and pink. Eggplant is a popular ingredient in a variety of cultures. Italians often use it sliced and baked, grilled or fried. In the middle east it is the key ingredient of a dip called Baba Ganouj. Eggplant typically has a tough outer skin and a soft spongelike flesh. It has a mild flavor that can be a bit peppery. Before cooking, it is often sliced and salted which removes water, this helps reduce the amount of oil absorbed when frying. Different varieties of the plant produce fruit of different size, shape and color, especially purple, green, or white. There are even orange varieties.The fruit flesh is smooth; as in the related tomato, the numerous seeds are soft and edible along with the rest of the fruit. The thin skin is also edible, so peeling is not required. Colors: Colors vary from white to yellow or green as well as reddish-purple and dark purple. Choosing: Smaller, immature eggplants are best. Full-size puffy ones may have hard seeds and can be bitter. Choose a firm, smooth-skinned eggplant that is heavy for its size; avoid those with soft or brown spots. Gently push with your thumb or forefinger. If the flesh gives slightly but then bounces back, it is ripe. Procuring: The most widely cultivated varieties (cultivars) in Europe and North America today are elongated ovoid, 12–25 cm wide (4 1/2 to 9 in) and 6–9 cm broad (2 to 4 in) in a dark purple skin.In tropical and subtropical climates, eggplant can be sown directly into the garden. Eggplant grown in temperate climates fares better when transplanted into the garden after all danger of frost is passed. It may also be roasted in its skin until charred, so that the pulp can be removed and blended with other ingredients such as lemon, tahini, and garlic. Cleaning: Salting and then rinsing the sliced fruit (known as "degorging") can soften and remove much of the bitterness though this is often unnecessary. Eggplants are very perishable and become bitter with age. They should be stored in a cool, dry place and used within a day or two of purchase. To store in the refrigerator, place in a plastic bag. If you plan to cook it the same day you buy it, leave it out at room temperature. History: The plant is native to India. It has been cultivated in southern and eastern Asia since prehistory, but appears to have become known to the Western world no earlier than ca. 1500. Interesting information to my mind. Thank you for providing that info.